Does the human subconscious have the incredible ability to manifest thought-forms? Jacques Vallee was on the trail to this possible explanation for UFOs, aliens, fairies, and other bizarre manifestations years ago; it remains one of the more intriguing and credible explanations for a plethora of unknown phenomena today. I took these photos on a cheap (15 punts, Irish currency) camera back in 1991 in Co. Kilkenny, Republic of Ireland, in a meadow near the tiny village of Kilmoganny. I had rented the old cottage adjacent to this meadow which had 19 apple trees. Fairies are said to love apple blossoms and these trees were laden with blossoms. I have always been less sure that these fairy globe photos are actual phenomena than the flying light-form photos, which really do defy conventional explanation. Are these drops of water or dust? What are the odds that drops of water or dust would be in the same location where living beings might be? In other words, if you were photographing butterflies, you would expect to see them up in the apple trees or right by the daffodils. These fairy globes seem to have intelligence, as if they are hovering near the flowers like butterflies. The second photo shows an orb which/who seems to be the object of my focus. In fact, I saw nothing with the naked eye. It is the same with the flying-light form photos, it looks like I focused on them, but in fact, I did not see them at all. Were they registering in my subconscious perception? Perhaps I even beckoned them or created them with my subconscious mind. In rural Ireland, 1991, UFOs and aliens were not popular subjects. However, fairies and ghosts were an accepted reality by many people. I had just moved from San Diego, California, where UFOs and aliens were popular subjects but fairies and ghosts were not (not in 1991). Is it significant, therefore, that California then led the nation in UFOs sightings and it still does? And is it significant that a number of Irish people had experience with fairies and/or ghosts? Coincidence? Is there an actual coincidence in the entire universe? Perhaps not! Are Californians and the Irish manifesting what their respective cultures insert into their respective subconscious? At Ballinvaugh, which was the name of the old cottage I rented, my landlord’s mother told me of the fairies up in Castlemorris Forest, just across the soggy green field, and how they forbade a wedding procession from going through the forest when she was a teenager. This forest had trees which Walt Disney would envy: gnarly, huge ancient trees with almost frightening sentient personalities! A young local couple were getting married and had chosen to go from her house to his house via the forest because otherwise it was a very long walk. Everyone involved in the wedding, relatives and all, walked along the forest path or rode donkeys or horses. Right in the middle of the forest, nine fairies appeared, blocking the path. They were the size of 2 or 3 year old humans but were adults. My landlord’s mother said there were 2 females and 7 males, all dressed in clothes which were strangely old fashioned even then. “As if they were dressed for a part in a play,” she told me. She related this story hesitantly and seriously, no one else was around. I do not think that she was lying or pulling my leg because I was a curious American. I would not publicize her story now because she told it in confidence, but she was in her mid-80s then, and that was 21 years ago. I assume she has passed on. So there stood the fairies blocking the path. The wedding party was dumbfounded and frightened. Yes, they were bigger than the fairies and had some horses, so they could run over the fairies but you just would NOT do that! Bad fortune would ensue not only for you but for the betrothed couple and everyone’s children forever thereafter! I asked my landlord’s mother how the fairies communicated. She said she did not hear the communication but it was between the chief fairy male and the father of the bride who was heading up the marriage party’s journey through Castelmorris Forest. She never heard the fairies make a sound but she was 14 years old and was among those walking toward the back of the procession. 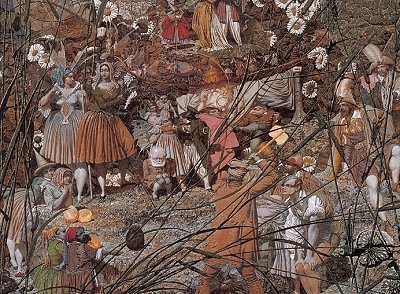 She peeked out through other members of the wedding party to see the fairies. Long story short, the wedding party turned around and went back, hurriedly. Certainly the fairies could have existed on their own. I hope they did and they do! However, there is the possibility that a sufficient number of human minds, some happily drinking and uninhibited, managed to manifest the fairies who lurk within the subconscious of their culture. The existence of fairies was within their subconscious because the Irish have cultivated the concept of fairies, ghosts, goblins, leprechauns, sprites, spirits, and more, for millennia. It is a part of them. In a similar way, back in Southern California, the UFOs keep coming. Yes, many people in California watch science fiction. I sure did and do! Perhaps we are putting the cart before the horse to blame the human UFO sighter for putting a science fiction spin on his sighting. It may well be that the subconscious mind of the human involved, participated in manifesting the UFO in the first place. The culture of a Californian might well be steeped in science fiction, everything from sci fi conventions or a trip to a film studio, to toys to films and television series. In other words, it’s not the human saying, ”I saw a UFO and I know it’s the aliens from Star Trek. Instead, it might be the human subconscious manifesting what permeates it culturally – a starship, or a reptile-alien right out of the film, Alien. Does this sound far-fetched? How can we accept that the Irish might play a part of the manifestation of fairies over there, and deny that we Americans might be part of the manifestation of aliens over here? I hasten to add that since 1991, the Irish have become more involved in UFO sightings and of course even in 1991, many Irish people were interested in UFOs and life beyond Earth. However, it wasn’t permeating the culture in those days, just as “fairies” do not permeate the general culture in America like UFOs do. Amazingly, quantum physics tends to validate this concept as it tells us that perception is all. We participate in creating our perception of reality! One last fairy tale: I became friends with the family down the road in rural County Kilkenny. They had a small rural grocery store. Liam, the father of the family, had been a twin but his twin died as a young teenage boy when his bicycle was hit by a car on the winding rural road. In all seriousness and with great sadness, Liam, who was usually a hard-nosed skeptic, told me that on the day before his twin was killed, he saw the banshee brushing her long dark hair. She was the size of a toddler but was a beautiful woman. She wore a long old-fashioned dress and was standing under a large tree. She seemed not to see Liam but continued brushing her hair. Liam saw her clearly and ran away as fast as he could. Liam knew that a banshee (“bean sidhe” in Irish Gaelic language), sighting meant a coming death in the family. The next day, his twin Charles was killed. Picture above is an impression of The Banshee. Do we study humankind’s long history with the paranormal, fairies and ghosts, to find the answer to UFOs and aliens? I tend to think that this is a valid path to understanding some UFOs and aliens, but that the UFO puzzle is such an enormous one, that within this puzzle, we can also find extraterrestrials from far distant planets, time travelers, and just about everything and everyone else under The Sun. However, as Pink Floyd tells us, The Sun is eclipsed by The Moon! Leap into Exo-Trekking! It’s free, exciting, and mind-boggling!